During the summer of 2018, REL Southeast staff presented multiple sessions for Georgia educators at the Georgia Literacy for Learning, Living and Leading (L4) Institutes. The Georgia Department of Education was excited to provide these institutes in Valdosta, Savannah, Macon, Cartersville, and Athens as a part of their Striving Readers grant. Representatives from schools throughout the state were invited to send teams consisting of teachers and leaders for two days of professional development. REL Southeast shared literacy tools based on rigorous research which could be used by district-, and school-level practitioners. 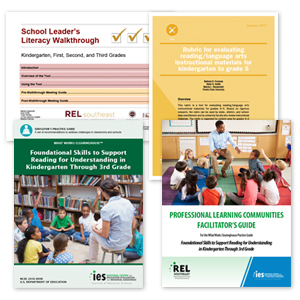 These tools included the School Leader's Literacy Walkthrough for Grades K-3; the Rubric for Evaluating Reading/Language Arts Instructional Materials for Kindergarten to Grade 5; a suite of self-study guides addressing literacy K-12; the Institute of Education Sciences (IES) practice guide Foundational Skills to Support Reading for Understanding in Kindergarten Through 3rd Grade and the accompanying professional learning materials for the guide. "Practicing evaluating actual activities that might be found in instructional programs was very beneficial!" "All of the literacy tools that were shared were very helpful. I will share them with my principal and instructional coach."